CAN YOU GUESS THE NAME OF PUNXSUTAWNEY PHIL'S MATE? HER NAME IS---DRUMROLL PLEASE............ PHYLLIS! 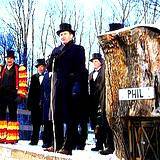 Every "Groundhog Day" Pennsylvania throws PA Winter Festival to show how much Punxsutawney Phil is depended upon every year for his weather prediction. It's a Pennsylvania Winter Festival legends and movies are made from. 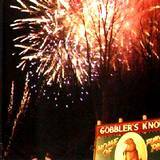 Each year on February 2 the traditional Inner Circle travels up Gobbler Knob to awaken the sleeping groundhog from his burrow to predict his weather forecast. If Phil sees his shadow that means there is 6 long weeks of winter left in the northeast United States. If Phil doesn't see his shadow then that's his prediction of an early spring. The Inner Circle, is also known as the men in funny high top hats. These men are in charge of taking care of Phil and making all the arrangements for the traditional Pennsylvania Winter Festival. 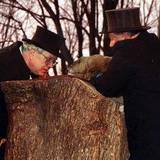 Groundhog Day is an historic tradition that started in 1887. In 1992 Bill Murrey visited the town of Punxsultawney, PA to attend the PA Festival to research his role in the up coming movie. 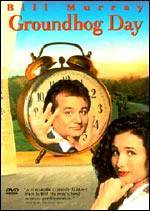 In 1993 the movie "Groundhog Day" was released. In 1996 Punxsultawney Phil got his first website. In 1998 Phil broadcast on the Internet his live prediction to the world. Pennsylvania's little groundhog is world famous and we couldn't be more proud of Phil. 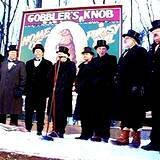 The History of "Groundhog Day"
"Groundhog Day", February 2, is a popular tradition in the United States. The tradition ties back to the days when nature was all we had to predict our future weather forecast. The tradition stems from an old tradition from the European countries and "Candlemas Day". It was known as a Christian tradition. On "Candlemas Day" the clergy would distribute blessed candles to the people to mark the beginning of spring. If the day was cloudy and cold that was a sign of an early spring. Pennsylvania's earliest settlers were Germans. They brought the tradition of the legend of the hedgehog with them. The hedgehog would cast its shadow and predict 6 more weeks of winter, also known as, "Second Winter". 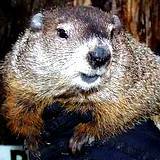 The Pennsylvania groundhog was so similar and abundant that the German's adopted the groundhog as their traditional weather predictor. 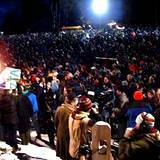 "Groundhog Day" brings tens of thousands of people from all over the world to celebrate this PA Festival. It's celebrated with a fireworks display, music, and festive activities that will last for several days. Admission to the annual Winter Festival is always free! Reservations for hotel and motel rooms should be made well in advance. There is rarely a room left in the town of Punxatawney during the PA Festival.